When it comes to sandwiches, I prefer classic deli varieties with well seasoned meats and flavorful breads over a simple ham and cheese or a turkey sandwich. 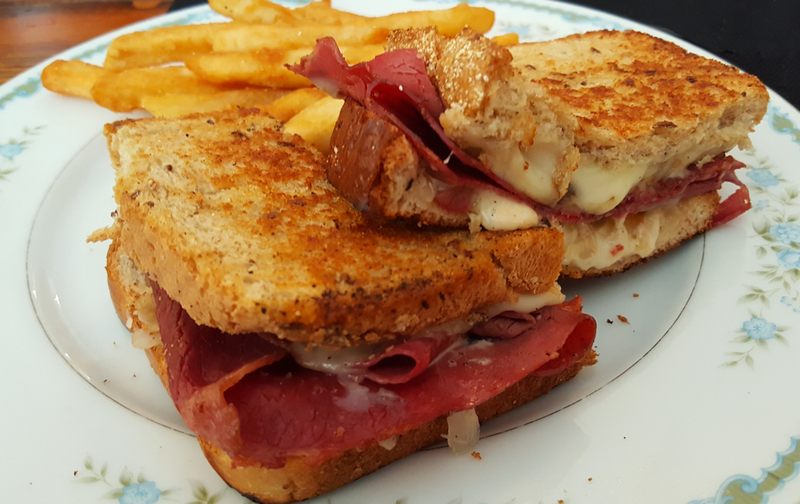 One of my favorites is the Reuben. From the former owners of the Hangar comes Lanier’s on 2nd St. Photo by Doug Deal. To some the thought of corned beef, rye, Swiss cheese, sauerkraut and remoulade sauce (in the Lanier’s variety) might not sound appetizing, but it is something that I crave from time to time. Usually, they are disappointing as restaurants tend to take too many liberties with the definition. Sometimes the meat is substituted with ham or the bread isn’t rye. Often the sandwich can be out of balance, where there is either too much or not enough sauerkraut. The version of the sandwich by Lanier’s on Second St. was delicious. There was the lightly tangy zing of the kraut but it didn’t overpower the light earthy flavor of the rye. The remoulade didn’t significantly change the sandwich from the Russian dressing original, but gives Lanier’s a trademark touch. Lanier’s Reuben with a side of fries. They make it their own by using a remoulade sauce instead of Russian dressing. Photo by Doug Deal. The one disappointment for us was that they were out of stock on a number of items. I tried to order the onion rings, but had to switch to fries since they did not have them that day. My wife tried to order their wings, but they were also out of those. The fries were well made, but are a bit boring for a food review. They also offer additional sides like vegetables, grilled and baked potatoes and pasta salads, or what my wife ordered, fried green tomatoes. Tomatoes came out looking marvelous and tempting on the plate. Perfectly browned in color, but my wife said that they were not as tangy as she likes. 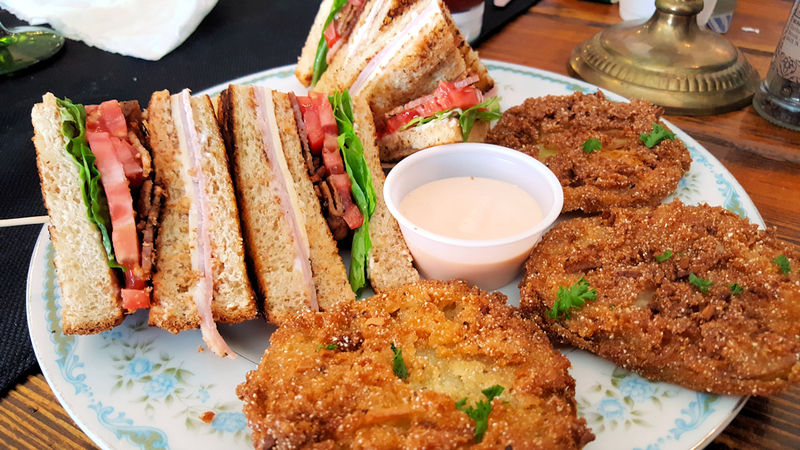 Lanier’s ham and turkey club sandwich with a side of fried green tomatoes. Photo by Doug Deal. To finish off our meal, we shared a slice of 14 layer caramel cake. Their desert slices are more sized for an individual portion than most restaurants, but because it was a light lunch, it met our needs. The cake was light and sweet and was a good end to a lunch of sandwiches. 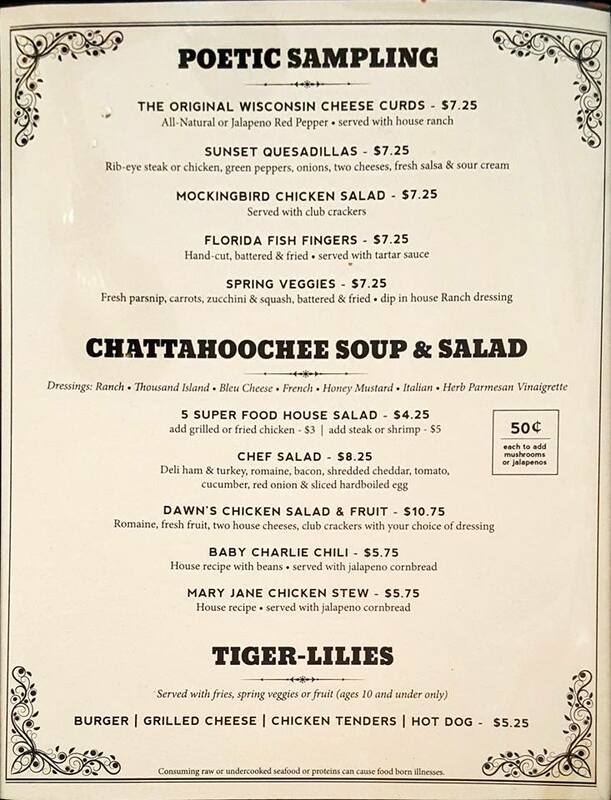 Lanier’s has a number of other items for a heavier meal, such as chicken, steaks, shrimp and salads. There is also a selection of options for children. As for drinks, they are a Pepsi establishment but also has sweet an unsweet tea. 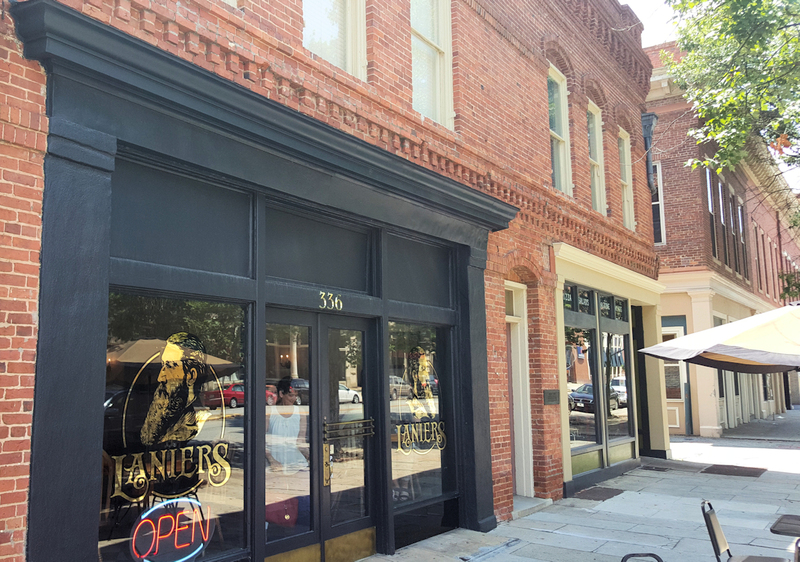 Lanier’s is located at 376 2nd St in downtown Macon near the Cox Capitol Theatre. 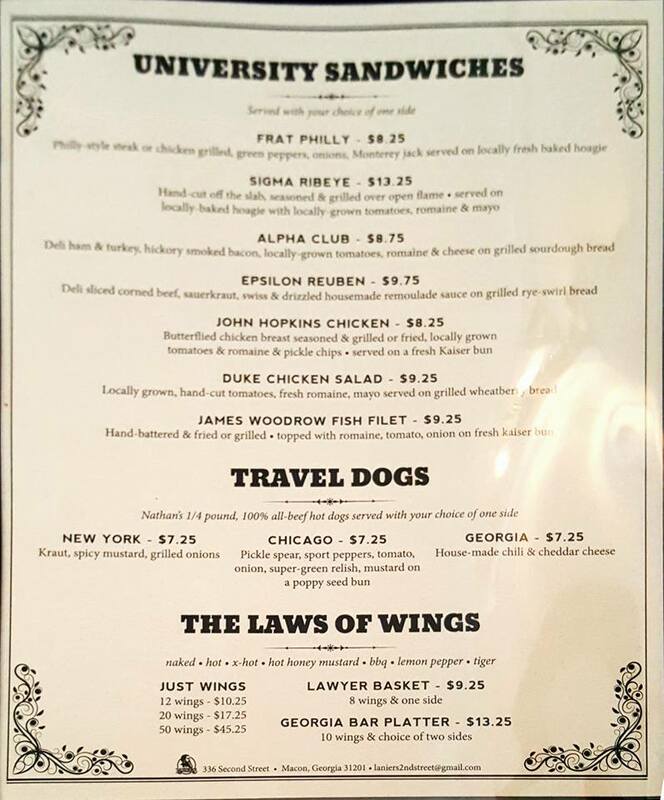 This restaurant is named for Macon native, poet, musician and author, Sidney Lanier and is owned by Dawn Davis, the former proprietor of the Hangar, who used to have some of the best bar food in Macon. Page 3 of Lanier’s Menu. Photo by Doug Deal. 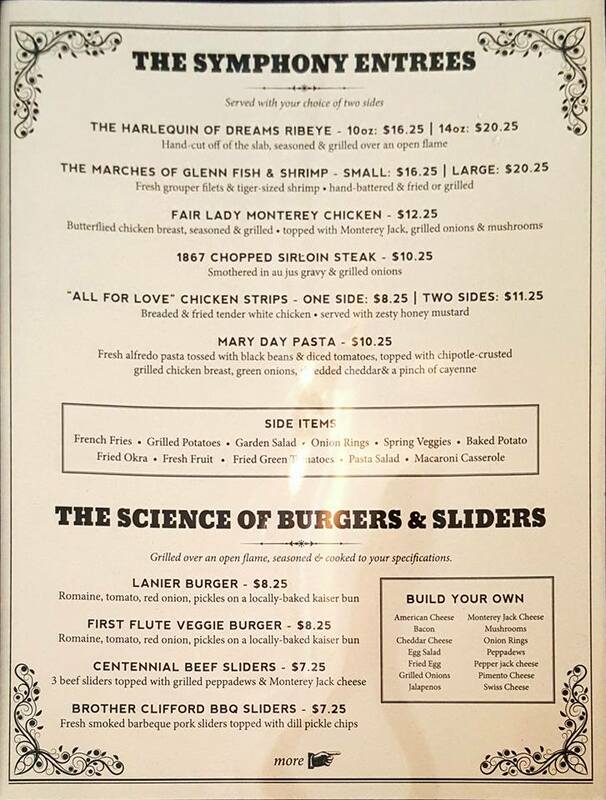 Page 2 of Lanier’s Menu. Photo by Doug Deal. Page 1 of Lanier’s Menu. Photo by Doug Deal.